Andrew Calvin, M.D., spends plenty of time in a doctor's office — his own. Dr. Calvin, a cardiologist at Mayo Clinic Health System in Eau Claire, Wisconsin, cares for patients every day. But he says his eyes were opened when the tables were turned, and he became the patient. "I had nagging back pain that I thought was from a run-of-the-mill muscle strain," Dr. Calvin says. "I took over-the-counter medications and left it alone for a month — probably too long." 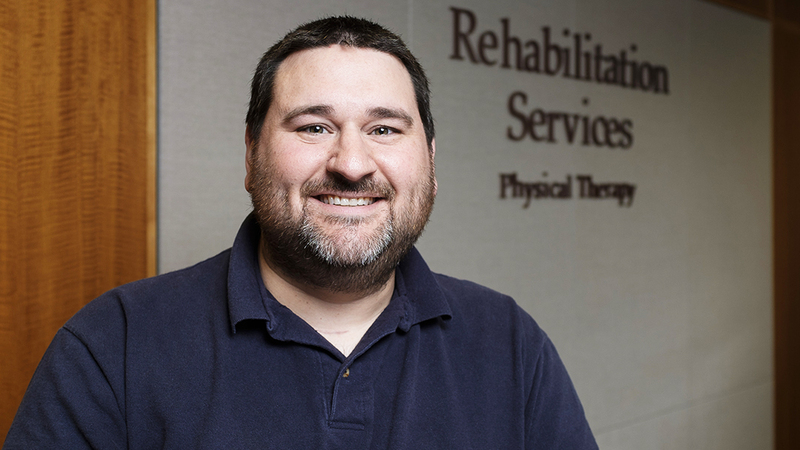 When Dr. Calvin started to feel pain shooting down his left arm, he went to see his primary care provider, who referred him to Physical Therapy. But the pain continued, so he made an appointment with Scott Spritzer, D.O., a Mayo Clinic Health System neurologist. "He picked up that I had some arm weakness, which I did not know about," Dr. Calvin says. "At that point, I knew that surgery was a real possibility, and I was scared." An MRI revealed that Dr. Calvin had a compressed nerve in his neck. Dr. Calvin brought his wife, Leah, along to his next appointment with Jonathan Bledsoe, M.D., a spine and neurological surgeon. He says having her there was helpful. "She had a notepad with questions I would not have remembered to ask," Dr. Calvin says. "I have to admit I felt silly, as a doctor, having to ask some very basic questions." Dr. Bledsoe says having a second or even a third pair of ears in the room for such an appointment is helpful, and no patient should ever be embarrassed to ask a simple question. "The team was great. I would send a family member or any of my patients to them in a heartbeat." "Once I say, 'I'm going to have to do surgery,' all they're thinking is: 'Oh my gosh. I need to have surgery,'" says Dr. Bledsoe. "The other person can remember what I say and understand differently what I'm explaining. And I know it's a cliché, but there really is no such thing as a dumb question." What kind of care will I will need after surgery? How long will I need pain medications? What kind of restrictions will I be under and for how long? One of the questions Leah asked was how many of these procedures Dr. Bledsoe had performed. "He said he had done two that morning," Dr. Calvin says. "I knew I was in good hands." Dr. Bledsoe performed an anterior cervical diskectomy, removing two damaged discs from Dr. Calvin's neck, inserting a bone plug and fusing the spine — all through the front of the neck. When Dr. Calvin awoke after surgery, the pain in his arm was gone. Dr. Calvin says he realizes he waited too long to be seen about his neck and arm pain. Dr. Bledsoe says it can be hard for people to know when to come in. "General neck and back pain is a common problem," Dr. Bledsoe says. "You typically treat it with ice, heat and rest. When you get pain, numbness or weakness down the arm or leg, you definitely need to see your primary care provider right away." Along with gaining new insight into the experience of a patient, Dr. Calvin says he has a new appreciation for the colleagues who cared for him. "The personal touch and assurance were even more important than the technology," Dr. Calvin says. "The team was great. I would send a family member or any of my patients to them in a heartbeat." Check out tips to help you prepare for a medical appointment. Learn about resources available to Mayo patients and visitors. Connect with others talking about brain and nerve conditions on Mayo Clinic Connect.